Born 3 December 1933 in Sofia. 1986—1994 — Assoc. Prof. and head of Mineralogy Department at the National Museum of Natural History at the Bulgarian Academy of Sciences. Studied the magmatic and metamorphic processes and related minerals in the skarn formations in the Rila-Rhodopi geological area. Published the first data of the desilicated pegmatites in the Urdini Circus and finds there the first emerald deposit in the country, along with other rare minerals (chrysoberyl — the alexandrite variety, pink clinozoisite, fuchsite, etc.). At his request, the Urdini Lakes area was proclaimed nature conservation site in 1985 (the first for minerals in Bulgaria!). He also participated in the creation of protected nature parks of Vitosha, Rila and the Rhodopes, along with flora and fauna. Author of over 80 scientific articles published in specialised editions in the country and abroad. Most of them are related to the study of the geology and mineralogy of Rila. Has written about 20 popular works. His is the minerals part in the book ‘The Magic of Rila’. The first topo-minerarological map of Rila, with descriptions of some characteristic and rare minerals, has been made. He has made a significant contribution to the development of mineralogical exhibitions in the natural history and regional museums in the country and is a scientific consultant. 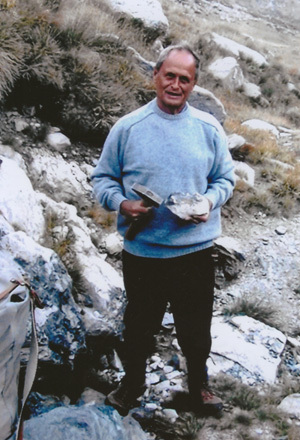 He is a member of the Bulgarian and Ukrainian mineralogical societies, as well as ProGeo (Sweden).